Zero-inflated negative binomial regression is for modeling count variables with excessive zeros and it is usually for over-dispersed count outcome variables. Furthermore, theory suggests that the excess zeros are generated by a separate process from the count values and that the excess zeros can be modeled independently. This page was updated using SAS 9.2.3. Example 1. School administrators study the attendance behavior of high school juniors at two schools. Predictors of the number of days of absence include gender of the student and standardized test scores in math and language arts. Example 2. The state wildlife biologists want to model how many fish are being caught by fishermen at a state park. Visitors are asked how long they stayed, how many people were in the group, were there children in the group and how many fish were caught. Some visitors do not fish, but there is no data on whether a person fished or not. Some visitors who did fish did not catch any fish so there are excess zeros in the data because of the people that did not fish. Let’s pursue Example 2 from above using the dataset fish.sas7bdat. In addition to predicting the number of fish caught, there is interest in predicting the existence of excess zeros, i.e., the probability that a group caught zero fish. We will use the variables child, persons, and camper in our model. We can see from the table of descriptive statistics above that the variance of the outcome variable is quite large relative to the means. This might be an indication of over-dispersion. Before we show how you can analyze this with a zero-inflated negative binomial analysis, let’s consider some other methods that you might use. Zero-inflated Poisson Regression – Zero-inflated Poisson regression does better when the data is not overdispersed, i.e., when variance is not much larger than the mean. Ordinary Count Models – Poisson or negative binomial models might be more appropriate if there are not excess zeros. A zero-inflated model assumes that zero outcome is due to two different processes. For instance, in the example of fishing presented here, the two processes are that a subject has gone fishing vs. not gone fishing. If not gone fishing, the only outcome possible is zero. If gone fishing, it is then a count process. The two parts of the a zero-inflated model are a binary model, usually a logit model to model which of the two processes the zero outcome is associated with and a count model, in this case, a negative binomial model, to model the count process. The expected count is expressed as a combination of the two processes. Taking the example of fishing again, E(#of fish caught=k) = prob(not gone fishing )*0 + prob(gone fishing)*E(y=k|gone fishing). Now let’s build up our model. We are going to use the variables child and camper to model the count in the part of negative binomial model and the variable persons in the logit part of the model. The SAS commands are shown below. 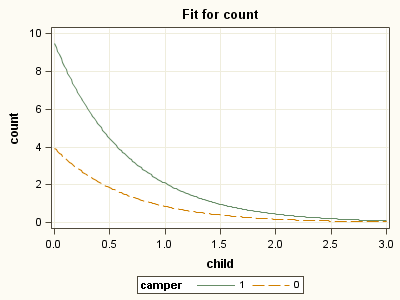 We treat variable camper as a categorical variable by including it in the class statement. This will also make the post estimations easier. In this particular example, we also explicitly want to use camper = 0 as the reference group. To this end, we sort the data in descending order and use the order= option in proc genmod to force it to take camper = 0 as the reference group. camper        0     0      0.0000      0.0000      0.0000      0.0000           .           . The output has a few components which are explained below. Model Information: General information about the data set, outcome variable, distribution and the number of observations used in the model. Class Level Information: For each categorical variable, the number of levels and how the levels are coded. The last displayed level will be the reference group in the model. In this example, it will be 0. Criteria For Assessing Goodness Of Fit: These measures are usually used for comparing models. Analysis Of Maximum Likelihood Parameter Estimates: Negative binomial part of the model, estimated using maximum likelihood. Analysis Of Maximum Likelihood Zero Inflation Parameter Estimates: Logistic regression part of the model, for estimating the probability of being an excessive zero. The predictors child and camper in the part of the negative binomial regression model predicting number of fish caught (count) are both significant predictors. The predictor person in the part of the logit model predicting excessive zeros is statistically significant. For these data, the expected change in log(count) for a one-unit increase in child is -1.515255. This amounts to a 78% (1 – e-1.515255 = .78) decrease in the expected count for each additional child in the party holding other variables constant. 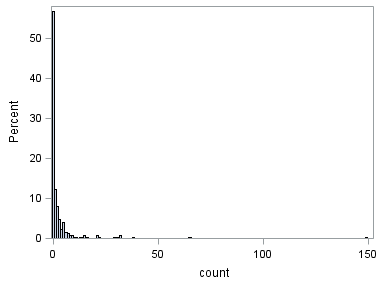 Groups with campers (camper = 1) had an expected log(count) 0.879051 higher than groups without campers (camper = 0), i.e., the expected count of fish for a camper is about 2.41 (e0.879051 = 2.41) times higher than for a non-camper. The log odds of being an excessive zero would decrease by 1.67 for every additional person in the group. In other words, the more people in the group ,the less likely that the zero would be due to not gone fishing. Put it plainly, the larger the group the person was in, the more likely that the person went fishing. The estimate of the dispersion parameter is displayed with its confidence interval. There seems enough indication of over dispersion, meaning that negative binomial model might be more appropriate. We might want to compare the current zero-inflated negative binomial model with the plain negative binomial model, which can be done via, for example, Vuong test. Currently Vuong test is not a standard part of proc genmod, but a macro program is available from SAS that does the Vuong test. You can download this macro program following the link and store it on your hard drive. In this example, we saved the macro program in d:/work/dae directory and rename it as vuong.sas. To use the macro program, we use the %include statement. This macro program takes quite a few arguments shown below. We rerun the models to get produce these required input arguments. We have also used the statement store to store the estimates so we can do post-estimation using the same model via proc plm without having to rerun the model. With the zero-inflated negative binomial model, there are total of six regression parameters which includes the intercept, the regression coefficients for child and camper and the dispersion parameter for the negative binomial portion of the model as well as the intercept and regression coefficient for persons. The plain negative binomial regression model has a total of four regression parameters. The scale parameters (scale1 and scale2) are the dispersion parameters from each corresponding model. The output above shows the Vuong test followed by the Clarke Sign test. The positive values of the Z statistics for Vuong test indicate that it is the first model, the zero-inflated negative binomial model, which is closer to the true model. Both of these tests have the same null hypothesis and it happens that the two tests are not consistent with each other leading a weak support for the zero-inflated negative binomial model. Now, let’s try to understand the model better by using some of the post estimation commands. First off, we examine the distribution of the predicted probability of being an excessive zero by the number of persons in the group. We can see that the larger the group, the smaller the probability, meaning the more likely that the person went fishing. 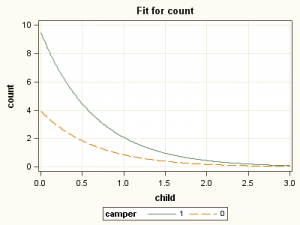 Since we have saved our model previous as m1 previously, we use proc plm to get the predicted number of fish caught, comparing campers with non-campers given different number of children. To get the predict counts we have used the option ilink (for inverse link). Notice by default, SAS fixes the value of the predictor variable persons at its mean value. Next, we can also ask proc plm to plot the fitted values by camper variable. Here are some issues that you may want to consider in the course of your research analysis. Question about the over-dispersion parameter is in general a tricky one. A large over-dispersion parameter could be due to a miss-specified model or could be due to a real process with over-dispersion. Adding an over-dispersion problem does not necessarily improve a miss-specified model. The zinb model has two parts, a negative binomial count model and the logit model for predicting excess zeros, so you might want to review these Data Analysis Example pages, Negative Binomial Regression and Logit Regression. Since zinb has both a count model and a logit model, each of the two models should have good predictors. The two models do not necessarily need to use the same predictors. It is not recommended that zero-inflated negative binomial models be applied to small samples. What constitutes a small sample does not seem to be clearly defined in the literature.